In the spring of 2017, Tentickle Stretch Tents was asked to provide a stage cover for the BBC Proms in Hull. This would be the first time in history that the BBC Proms had performed outside of London and their chosen city was Hull, The 2017 Capital of Culture. 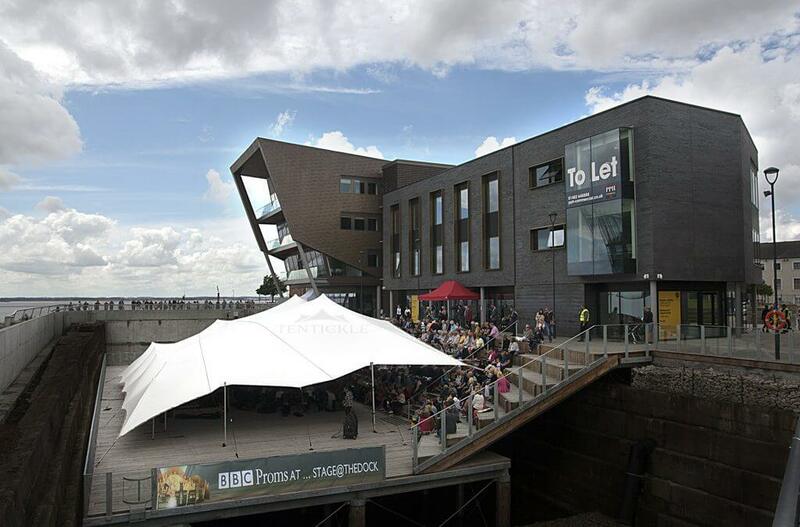 In keeping with the choice of music for the BBC Proms event, which was Handel’s Water Suite, the BBC Proms chose to perform close to the river Hull at a stunning waterside venue called Stage @TheDocks. With such a prestigious event taking place outside, no chances could be taken on whether the weather would hold and remain dry. With that in mind it was essential to find the right stage cover to allow the show to take place regardless of the weather. Tentickle had previously provided stage covers at the Stage @TheDocks before and so were asked if they could provide something similar for the BBC Proms. The BBC has very strict compliance needs that must be met sufficiently. Tentickle Stretch Tents provided all health and safety documents, risk assessments and weather monitoring. The wind is an extremely important factor for any type of temporary structure. We use a combination of wind forecasting services and on-site wind meters to determine the suitability of installing a stretch tent; safety is paramount and overrides any client’s wishes. With everything in place for a safe installation the Tentickle Stretch Tent could be installed ready for the Proms on 22nd July 2017. The professional crew installed the 15m x 20m stretch tent stage cover in 4 hours. Once fully installed the orchestra were allowed to enter the tent and set up ready for the Proms. The event was a huge success and was broadcast live on BBC Radio 3. Here is a picture from the day. We thoroughly enjoyed working with all parties involved and it was a fantastic moment in history for Hull the 2017 City of Culture.